"Hi, I'm trying to work through one of your tutorials but it's telling me to click on the layer mask icon in the Layers palette and, well, I don't see it! I'm using Photoshop Elements. How do I add a layer mask in Elements?" In a perfect world, Photoshop Elements would come bundled with every new consumer-level digital camera. It is, without a doubt, the best deal going in photo editing, and it's what I like to call "Photoshop for normal people". You get everything the average person would need to do extraordinary things with their digital photos at a fraction of the cost of the full-blown, professional version of Photoshop! Of course, the smaller price tag does come with its own cost. Many of the more professional-level features of Photoshop are not included in Photoshop Elements, and unfortunately, the layer mask feature is one of them. The official answer from Adobe on "how do I add a layer mask in Elements?" is "You can't. 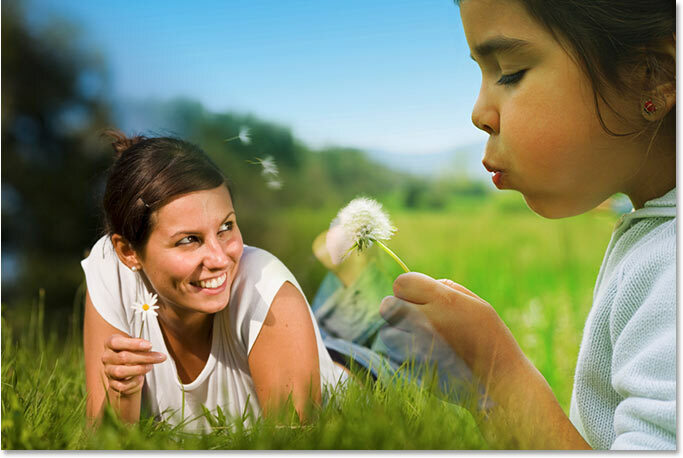 Layer masks are not included as part of Photoshop Elements". But with you and me being as clever as we are, we're not going to let a little old "official answer" stop us! The truth is, Photoshop Elements does support layer masks, but only with adjustment layers. An adjustment layer always comes with its own built-in layer mask, which is one of the reasons why they're so useful. Well, what if we could "borrow" a layer mask from an adjustment layer somehow, or maybe "share" its layer mask with a normal layer? It sounds crazy, I know, but is there some way to do that? Let's see how to do it. 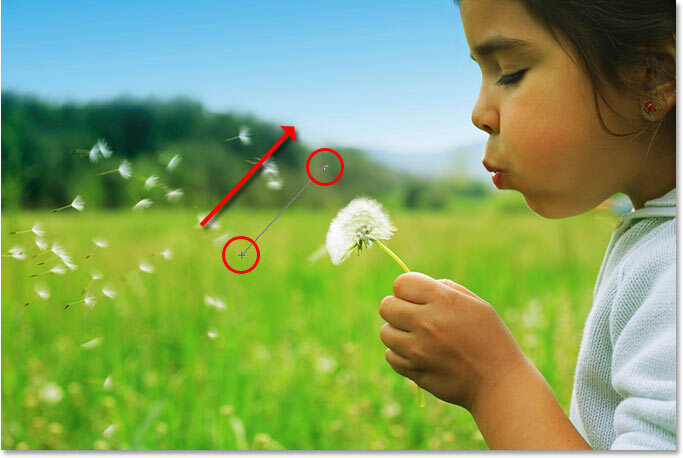 We're going to look at a simple example of how to blend two photos together in Photoshop Elements, just to see how easy it is to share an adjustment layer's mask with a normal layer. I'll be using Photoshop Elements 5 for this tutorial. Before we begin, I should point out that we're not going to be covering the details of how layer masks work. If you need to know more about them, be sure to read through our Understanding Layer Masks tutorial in the Photoshop Basics section of the website. Make sure you have Maximize Mode turned off so that both images are appearing in a document window. To turn it off, go up to the Window menu at the top of the screen, choose Images, and then make sure that Maximize Mode doesn't have a checkmark beside it. If it does, click on the option to turn it off. Both images should now be appearing in their own document window. Selecting the Move Tool in the Tools palette. 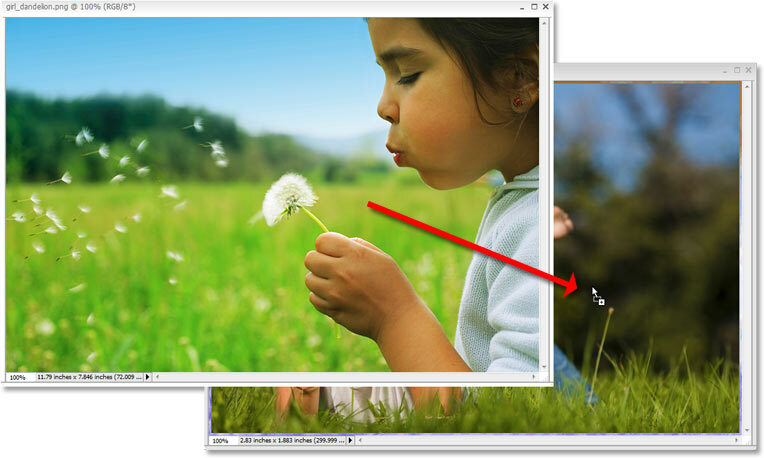 With the Move Tool selected, click anywhere inside one image and drag it into the document window of the other image. Both images are now inside the same document, and each one is on its own separate layer. Click on the Background layer to select it in the Layers palette. Click OK to exit out of the Levels dialog box without making any changes. The Layers palette showing the new Levels adjustment layer along with its layer mask. We have our layer mask. So far, so good. Problem is, the layer mask is on the adjustment layer, and what we need is for it to be on "Layer 1" so we can use it to blend the photo on "Layer 1" with the photo on the Background layer. There's no way for us to add a layer mask to anything other than an adjustment layer in Photoshop Elements, so we need some way of sharing that layer mask on the adjustment layer with "Layer 1" above it. Selecting "Group with Previous" from the "Layer" menu. The Layers palette showing "Layer 1" now grouped with the adjustment layer below it. At this point, with the two layers now grouped together, anything we do to the layer mask on the adjustment layer is going to affect "Layer 1" in exactly the same way as if the mask was actually on "Layer 1". We've now effectively added a layer mask to a normal layer in Photoshop Elements, and we can now use the layer mask to blend the two photos together! Click on the layer mask thumbnail in the Layers palette to select the layer mask. Selecting the Gradient Tool from the Tools palette. Select the black to white gradient from the Gradient Picker. Dragging a short, diagonal gradient to define the area where the two photos will blend together. The layer mask thumbnail in the Layers palette showing the gradient that was drawn. The two photos are now blending together thanks to the layer mask on the adjustment layer. As we've now seen, even though Photoshop Elements doesn't officially support layer masks, at least not to the full extent of the professional version of Photoshop, it does allow us to use layer masks with adjustment layers. All we need to do then is add any adjustment layer below the layer we would normally want to add the layer mask to and group the two layers together! It's a couple of extra steps, but it works!